At Mass at Casa Santa Marta, Tuesday morning, Pope Francis talked about how to deal with the devil who though defeated and dying is still dangerous. Never approach the devil nor talk to him: he is "defeated" but dangerous because he seduces and, like a chained angry dog, bites if you go to pat him. 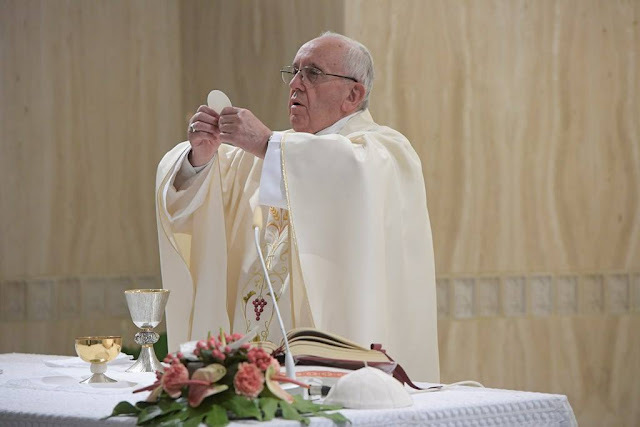 Pope Francis offered this advice in his homily at Mass, Tuesday morning, in the chapel of the Casa Santa Marta in the Vatican. Commenting on John’s Gospel where Jesus says “the ruler of this world has been condemned," the Pope spoke about the seduction of the devil and how to deal with him. The Pope said that even though the devil is defeated and dying he has a great power and capacity to seduce. He promises many things, bringing us beautifully packed gifts, without revealing their contents. The Pope compared the devil to a dying crocodile, who hunters advise not to approach because it can still strike you dead with its tail. Hence the devil is very dangerous, his proposals are all lies and we foolishly believe him. The Pope described the devil as the father of lies, saying he speaks well, he can sing in order to deceive and he is loser who moves about like a winner. His light dazzles like the fireworks but does not last. Instead the light of the Lord is "gentle and permanent". The devil, the Pope said, knows how to seduce us in our vanity and curiosity and we buy everything, falling into temptation. Knowing that a thought, a desire or move is dangerous and we still go there, it is like approaching the devil who is like a chained angry dog that can still bite. Unlike Eve who thought herself a “great theologian” and fell, the Pope said we must never dialogue with the devil because he wins, he is more intelligent than us. On the contrary, Jesus in the desert responds to the devil with the Word of God, hunts down demons, sometimes asking his name but doesn't dialogue.